Note: if you have formatting issues, please let me know; I’m trying to embed the interactive charts, but have had issues with them in the past. They may go away without notice. – Barry Ritholtz asks – How bad is housing? What does all of that mean if you’re trying to figure out what’s happening in the Charlottesville, Virginia real estate market? 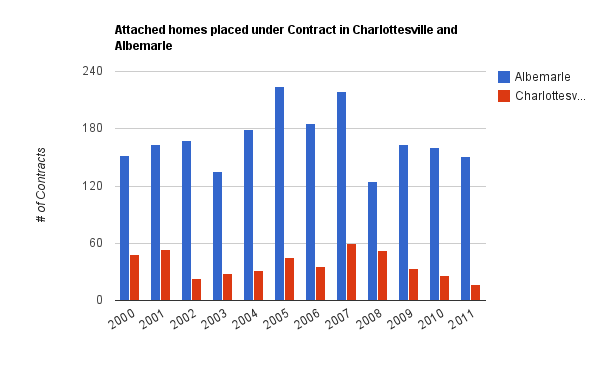 Let’s look at the data for homes placed under contract in the Charlottesville MSA*. Homes place under contract gives the best “real time/what’s happening now insight ino the Charlottesville real estate market. – There is no consistency in the market, except for a few truisms. – Things that shouldn’t sell do. – Things that should sell don’t. – Buyers are buying with minimum 5 to 7 year time frames in mind, and many are looking for 10 – 15 years. – Buyers are being very selective, because they can be. – Some buyers are looking for attached homes that have little to no maintenance; but … high HOA fees are deterring buyers. $200+/month is not a good thing (usually). – Properties must be priced right in order to have a good chance of selling. – Properties must be in as close to perfect condition in order to solicit the best offers from those seeking to (and many are) pay a fair value. – Price + Condition = Good chance of selling. – Sometimes the price is right, the condition is right, but the buyer just isn’t there. yet. – Market capitulation isn’t quite here yet. * Using the Charlottesville Area MLS, which is either “good enough” and/or “the best we have”. I tend to trust it about 85%-90% of the time; it tends to have about 90% of the real estate transactions in the Charlottesville MSA**. The single greatest reason for data inaccuracies are the real estate agents entering the data. ** Charlottesville MSA is Charlottesville, Albemarle, Fluvanna, Greene, Nelson and sometimes Louisa, which isn’t technically in our MSA, but sometimes sort of is in practice. ***Properties placed under contract – we have no way to match up (unless one were to manually verify each property record) whether individual contracts written equate into closed transactions. My experience says that ~80% of contracts written ultimately close; but there is also no way to see (without manually … ) whether 123 Main Street had three contracts on it before it closed. What are the numbers for 2011 compared to 2010 and before. Is 2011 Jan – May and the others Jan – Dec or are the other numbers also Jan – May? It is not clear from the article. Thanks. Everything here is based on 1 January – 1 May 2011 versus the same timeframe in 2010.